Matching wine with your mood, selecting any of the possible wine bottle openers, decanting it, pouring and enjoying it is often the highlight at the end of a hard day. Looking to buy wine bottle openers online? Click here to browse HVV's selection! Wine comes in many different styles. There is something to satisfy even the most discriminating taste. It can suit all budgets. It can be an ambassador at any social occasion. Sigh...Wine is such a wonderful thing!! How does one successfully open a bottle of wine without a) dislocating one's shoulder b) pulling out old wrestling moves that went out of fashion circa 1970 or c) lose all credit as a self-respecting wine lover.. In the past, this could become a major embarrassment. Even wine aficionados could suffer defeat at the hands of a particular bottle. But alas, today, wine lovers of all shapes and bicep sizes can relax...technology has advanced beyond the basic bottle opener. It is now possible to select any of a number of specific wine bottle opener designs. Whether it is part of a gift basket or a new toy for the wine boy, it is possible to select a new and different wine bottle opener to delight even the most finicky of friends. In fact, there are antique corkscrews, classic bottle openers and even quirky or decorative specialty openers. Behold the lowly corkscrew. This device has been responsible for opening wine bottles for many years, centuries in fact! When using a classic corkscrew, sometimes the cork simply pops right out of the bottle. Other times, dismal failure results and bits of cork drop down into the bottle (mmm..delicious!). Lever Style: These are more recent in popularity. It features a wing on either side. The intent, as with all corkscrews, is to remove the cork. With this type, however, removal takes place in one easy movement. Screwpull: Often employed in home use, this tool features a longer worm (screw part). It does not come with a foil cutter. Butler’s Friend: This type of opener is usually reserved for fragile corks. Another name for it is the Ah-So. A unique device, this corkscrew is for those with some expertise. It demands skill, and patience, in removing the cork since it does not puncture the cork but pulls it out without making a single hole. Pump Style: This is a technical wonder. Using a little skill and a CO2 cartridge, it is easy to pop out the cork. Brands of corkscrews include Forge de Laguiole Corkscrews and Rogar Corkscrews. Wineries offer their own brand and/or have their own preference. Bottle Openers – Goin' Electric, Baby! Rather than mussing and fussing with a bottle’s cork, many have turned to the electric bottle openers. These sleek and very stylish ways of opening wine bottles may be more expensive than the hand-operated ones, but they are an easy-peasy alternative. You hardly have to lift a finger! In most cases, you simply push a button. The electric wine opener reaches in and the cork pops out - no fuss, no mess, no bother. Wine bottle openers are obviously a necessary wine accessory. 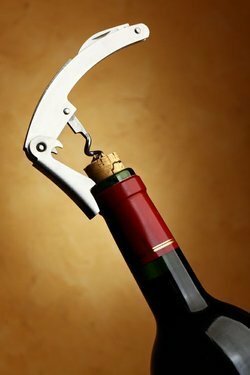 So finding a wine opener that you love to use is essential if you want to adopt the wine lifestyle. While a little bit of cork floating in a bottle of wine is acceptable, too much is not. Determine your needs and look at what is available. Do research online and talk to other wine lovers. In the end, select a wine opener that suits your needs and your pocket book. The right match can make all the difference!